Intel calls it the Mobile Internet Device (MID); Nokia calls it the Internet Tablet; Apple calls it an iPod (or the “first mainstream Wi-Fi mobile platform“). And that’s before we factor in so-called Ultra Mobile PCs (UMPCs) based on Microsoft Windows or low-cost Linux alternatives. In 2008 it seems that there is no shortage of companies (beyond smart phone makers) wanting to put the “Internet in your pocket”. Over the Christmas holidays I got to play with one such product: Nokia’s N810, the third device in the company’s relatively new Internet Tablet lineup. But before I get to my hands-on impressions of the N810, I want to make a few observations about the product category in general. These aren’t smart phones; in other words they don’t come with cellular radio capability but instead rely on Wi-Fi and, in some instances, the ability to piggyback a cellphone connection via Bluetooth. In an ideal world any device designed to access the Internet “on the go” would support both Wi-Fi and cellular connectivity, since Wi-Fi access is far from ubiquitous. And while the form factor of many of these products (not to mention their drain on battery power) make it desirable to carry a cell phone and a dedicated mobile Internet device, I suspect the main reason for omitting a cellular radio is the need to bypass the mobile phone networks in order to bring the device to market (and, at the same time, keep costs down). When looking at the form factor and features of many of these devices, I also get a feeling of déjà vu. At first glance, what’s the difference between one of these new fangled pocket-sized Internet tablets and products such as the nearly extinct Wi-Fi enabled PDAs from Palm or Window-based Pocket PCs? And if I said an Ultra Portable PC with a touchscreen and flip-out QWERTY keyboard, I could just as easily be describing a PSION Series 5 released over 10 years ago. Of course, many of these early mobile devices eventually gave way to the smart phone, so in a sense it feels like we’ve come full circle. Anyway, back to the Nokia N810. The first thing to notice about the N810 – beyond its good looks and very solid feeling build – is how Nokia is pitching the device. 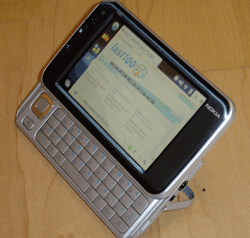 Despite its relatively high price and Linux foundations (Nokia’s Maemo-based Internet Tablet OS 2008), the N810 is being pitched as a consumer-friendly device for those who want to stay connected to the social Web. “With the ability to check emails, read the latest gossip online or IM to your friends, share your moods on your favorite social sites; call via Skype, or get closer by the Gizmo video chat… you’ll never be far away from those you want to keep in contact with”, boasts the Press Release. To achieve all of this, the N810 features a Wi-Fi connection and Bluetooth (for pairing with a mobile phone), full M0zilla-based Web browser, webcam, microphone and stereo speakers, as well as a touchscreen and QWERTY keyboard. Also included is an email client, RSS reader, Skype, Gizmo and a media player, all stored on the devices 2GB of internal memory (upgradeable via a MiniSDHC card slot). Additionally, the N810 features GPS and Nokia’s Maps application. Positioning the device as a social Web companion is quite a departure from how Nokia’s earlier Internet tablets were marketed to early adopter-types likely to write applications as well as use them (see below). 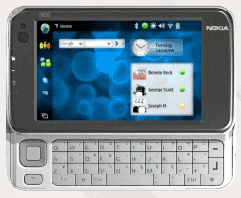 The N810’s UI is fairly intuitive and can be operated for the most part via the touchscreen or keyboard. The home screen employs optional “widgets” for displaying RSS headlines, shortcuts (such as Google search) and a clock. Down the left-hand side are large icons providing access to the various application and settings menus. Running applications and windows can be closed or “maximized” in PC-like fashion by tapping in the top right hand corner. In fact, anybody who has used a Windows-PC or Mac will feel right at home using the N810. The downside is that it can be quite fiddly, if not impossible, to operate the device using a finger (iPhone-style) rather than the included stylus. Much of the N810’s promise is in its ability to access the full web (not the “baby Web”), so how well does its Mozilla-based browser stand up to the test? Pretty good but a tad slow is the short answer. In many respects this is “Firefox in your pocket”, since the N810’s browser was able to handle most of the Ajaxy Web 2.0 sites I thew at it, including the desktop version of GMail. And, unlike the iPhone/iPod Touch, the N810 supports Flash Video, so accessing the main YouTube site was also possible. Having said that, page rendering was slow, while scrolling and zooming was frustratingly so. Bottom line: the N810’s Web browser can certainly get the job done where other mobile browsers trip up. But if you’re used to the speed and UI elegance of Apple’s iPhone/iPod Touch Web browser (once you’ve double-tapped or “pinched” to zoom, there’s no turning back), you’ll be somewhat disappointed. After a software update (to the latest version of Nokia’s Internet Table OS), Skype was up and running and I was able to Instant Message and place a call as if I was using the desktop PC version. The built-in microphone and speakers were clear, although of course there’s also the option to use a hands-free kit or Bluetooth headset. The N810 makes a very capable media player, supporting most common audio and video formats such as MP3, AAC and RealAudio (audio), and 3GP, AVI, MPEG-1, MPEG-4, RealVideo, WMV and H.264 (video), with one caveat: the processor on the N810 isn’t without its limitations, so videos will need to be below a certain bit-rate and size to be supported, depending on codec (don’t expect anything near to HD). The screen on the N810 is nice and large (4.13-inch 800 x 480), producing a very crisp image. A Rhapsody client is also included for access to Real’s subscription-based music service. In addition, the N810 supports third-party applications, which currently include a number of alternative media players. One very nice touch (which I was unaware of at the time of review) is that the N810 also supports the Universal Plug and Play (UPnP) standard, meaning that the device can operate as a media sever to share audio, video and photos with a PlayStation 3 for example. Looking around the N810’s third-party software directory a few months ago, I was a little underwhelmed by the selection on offer as quite a few applications weren’t yet updated for the 2008 version of Nokia’s Internet Tablet OS. As of today, the directory lists 144 applications in total, covering the usual suspects: IM and email clients, media players, PIM software and text editors etc. Even as recent as a year ago, the N810 would have easily impressed. But today we live in a post-iPhone world, in which the expectations for mobile Internet devices have been raised significantly. In it’s defense, the N810’s browser is more robust and standards compliant than the iPhone (e.g. support for Flash), it’s just not nearly as much fun to use and suffers from slow rendering, scrolling and zooming. Likewise with the device’s UI; it gets the job done but feels too PC-centric compared with the iPhone/iPod Touch’s Multi-Touch interface. One area where the N810 trumps other offerings is that it is a truly open platform whereby third-party apps can be written for the device and Nokia doesn’t act as gatekeeper. Whether or not Apple will match this (or act as middle person as many suspect) we’ll find out as soon as the company releases its Software Developer Kit for the iPhone/iPod Touch in the next few weeks. Hi Steve, just to say really enjoyed the review (any article that mentions the Psion Series 5 is good by me!) and I’ve posted it on the WOM World (www.womworld.com). The stock UI may be PC-centric but the easily-installed fully-functional LCARS theme gives ipod touch some very serious competition. I find it quite easy to use the 810 without a stylus but the touch is definitely superior. As for web browsing, it can be painfully slow on large pages yet everything actually works–just like a real computer–unlike safari on my touch which fails to render or load fairly common things like flash and realvideo. Apples and oranges.